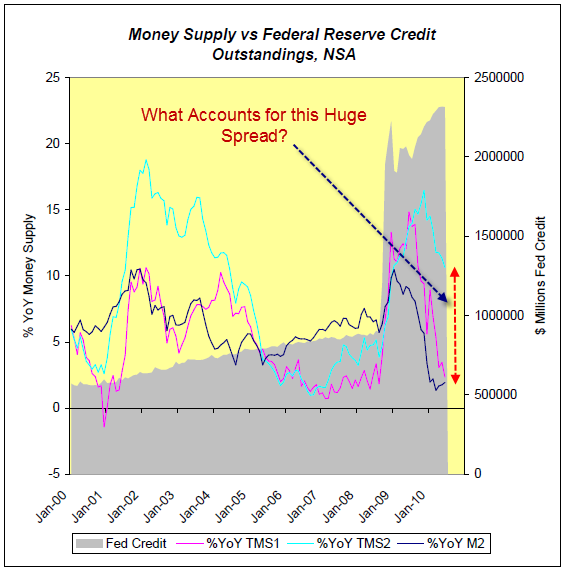 Mish's Global Economic Trend Analysis: Money Supply Divergence - TMS1 vs. TMS2 vs. M2 - What does it Mean? Money Supply Divergence - TMS1 vs. TMS2 vs. M2 - What does it Mean? Inquiring minds are once again digging deep into money supply questions. They are intrigued by the fact that money supply measures M2 and TMS1 are plunging towards zero, while TMS2 is still sporting a hefty 10+% year-over-year growth. TMS stands for "True Money Supply". The suffix (1 or 2) stands for alternate measures, one including savings accounts and the other not. M2 is a widely used Fed aggregate for money. This looks technical (and it is), but please bear with me. I can and will explain in easy to understand terms exactly what is happening and why, along with what it all means. The above chart courtesy of Michael Pollaro - Austrian Money Supply. Annotations and arrows on chart by me. The idea behind TMS1 and TMS2 is to sort credit transactions from actual money available on demand. For all practical purposes, TMS1 consists of currency in circulation + checking accounts, + sweeps of checking accounts. 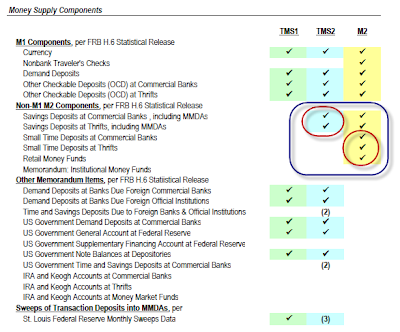 There is no dispute by anyone that the components of TMS1 represent money on demand. Think of it this way: Cash in your pocket and cash in your checking account are there whenever you want, on demand. Indeed, the banking industry refers to checking accounts as "DDA" accounts, Demand Deposit Accounts. Others want to include savings accounts, time deposits (CDs), and money market accounts in money supply measures. 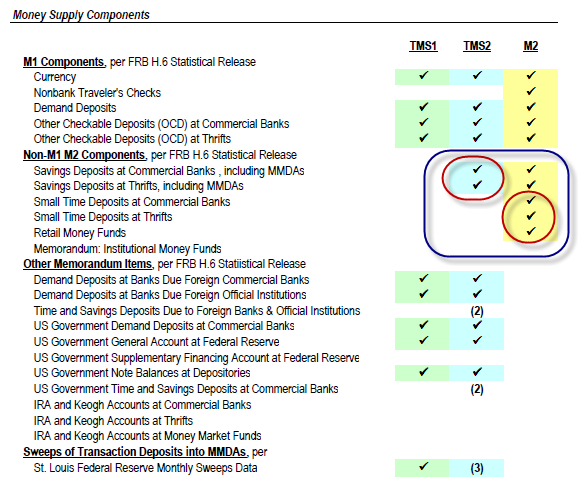 (1) To clarify any confusion for those readers familiar with Frank Shostak’s AMS metric, note that (a) as is the case with AMS, TMS1 excludes savings deposits but adds back bank deposit sweep programs, and (b) in contrast to AMS, TMS1 does not include the SFP account. M2 includes savings accounts + small time deposits (CDs) + money market accounts. TMS2 includes TMS1 + savings accounts but not money market accounts or small time deposits. With the exception of sweeps, the rest of the components have little effect. The main dispute between the TMS1 and TMS2 camps is in regards to what to do with savings accounts. Proponents of TMS2 claim savings accounts represent money available on demand, while proponents of TMS1 take the tact that savings accounts are "credit transactions" and should not be included in strict monetary aggregates. I have sided with TMS1 along with Austrian economist Frank Shostak on this point. We will return to the debate later but first let's first explore why M2 and TMS1 are dropping rapidly while TMS2 is not. Part of the discrepancy can be explained by close analysis of Small Time Deposits and Savings Deposits. Small time deposits are Certificates of Deposit - CDs under $100,000. For comparison purposes, "Large Time Deposits" include "Jumbo CDs", amounts above $100,000. 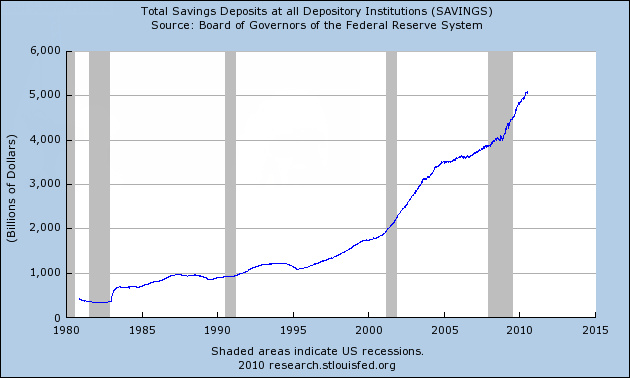 The chart shows Savings Deposits have been rising rapidly since the mid-1990's. One reason is Sweep Account Programs. Since January 1994, hundreds of banks and other depository financial institutions have implemented automated computer programs that reduce their required reserves by analyzing customers' use of checkable deposits (demand deposits, ATS, NOW, and other checkable deposits) and "sweeping" such deposits into savings deposits (specifically, MMDA, or money market deposit accounts). Under the Federal Reserve's Regulation D, MMDA accounts are personal saving deposits and, hence, have a zero statutory reserve requirement. 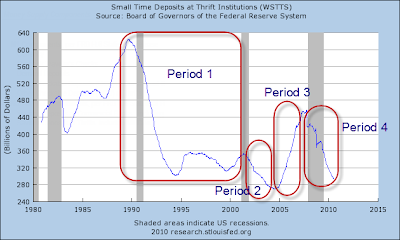 Retail sweep programs have substantially distorted the growth of M1, total reserves and the monetary base, as Chairman Greenspan noted in his July 1995 Humphrey-Hawkins Act testimony to the Congress. ..... The initiation of a sweep program of any importance sharply decreases a depository's reported checkable deposits and increases its reported savings deposits. In simple English: Savings accounts have no reserves while checking accounts do. Greenspan allowed banks to sweep money from checking accounts into savings accounts (unbeknown to customers) so that banks could lend out more of those deposits. Because of sweeps, reported M1 figures have been grossly distorted since 1995. Since M2 and TMS2 include savings accounts, neither has been affected by sweeps. TMS1 corrects the M1 problem by adding back in sweeps. 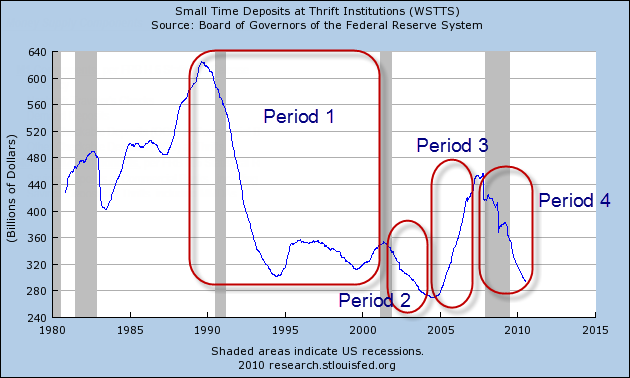 In addition to sweeps, there has been a pronounced shift in the attitudes of retail consumers saving money in Small Time Deposits (CDs). Let's take a look. 2. Decreased time preference for money in light of the stock market boom and productivity increases associated with the internet revolution. To understand period 1, one needs to add both charts for a composite. Taking the 1991 recession as the starting point and the 2001 recession as the ending point, and adding both charts together, the net result was huge decrease in demand for money (a decrease in the savings rate). People felt no need to save money in banks and regarded CDs as fodder for fools. Stock market speculation was the preferred method of saving. This period is part of what Ben Bernanke calls the "Great Moderation". What actually happened is increased productivity (primarily via the internet revolution) masked huge monetary inflation. As a result, corporate profits soared as did demand for equities, especially internet stocks. This culminated in the "dotcom" internet bubble and subsequent crash. Period 2 represents the aftermath of the internet crash with a Fed hellbent on bailing out banks massively underwater on bad loans made to failed dotcom companies and hopeless loans to Latin American countries starting to default. To bail out the banks, Greenspan slashed interest rates, holding them too low, too long. The result was an enormous housing bubble, unprecedented in world history. In practical terms, the result was a further decrease in demand for money accompanied by the widespread belief "my house is my savings and retirement plan". The phrase "decrease in demand for money" means people did not want to hold cash. Instead they wanted to buy houses, cars, boats, and things for their houses. 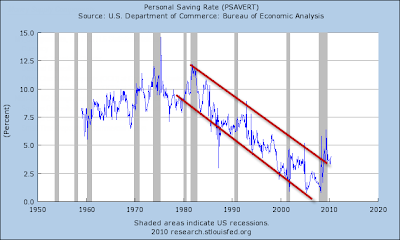 The savings rate went negative for the first time in history (recently revised to just above zero). Most thought home prices would rise forever and many took out loans against their homes to buy boats and cars or to take vacations. Others added rooms or remodeled comfortable they would get the money back and then some. People did not realize it, but they were playing the "greater fool" game never bothering to do the math or ask "who would be able to buy?" Inflation in period 2 was masked because the Fed and the CPI ignore housing prices in their analysis. Ironically, popular hyperinflationist sites such as Shadowstats probably underestimated price inflation in this period as well. Period 3 is quite interesting. Notice how a sharp upturn in demand for CDs preceded the popping of the housing bubble. Period 3 culminated with the Fed slashing short-term rates to near-zero percent. As a result CD rates plunged. Price inflation in this period was hugely overstated because crashing home prices were not properly factored in. Let's kick off the discussion with a question: Is this period like the "internet bubble" or the "Housing Bubble" where there was a decreased desire for saving and the economy (and inflation) is off to the races? Consumers have no demand for equities having been burnt twice badly already, first in the internet crash, then in the housing (financial), crash. Moreover, there have been recent and massive equity fund withdrawals. Moreover, massive numbers of boomers now in retirement or soon heading that way need (or will soon need) to drawn down those savings to live on. Boomers are now scared to death of further drawdowns, and in my estimation rightfully so. With plans to buy houses at all time lows, this is certainly not reflective of another housing boom. Why The Decline In CDs? For the answer, let's Compare CD Rates with Savings Deposit Rates. The above tables all courtesy of Bankrate.Com, a good place to visit for such comparisons. The question consumers face is whether to lock up deposits for a year at 1.5% or shift money to savings accounts at 1.3% as CDs expire. Is the .2% difference commensurate with the risk? I do not think so even though I sit squarely on the deflation side. So, what's the average person to think? Moreover, the same analysis holds true for 5 year CDs. Does anyone want to tie up money for 5 years at 3%? Most don't. 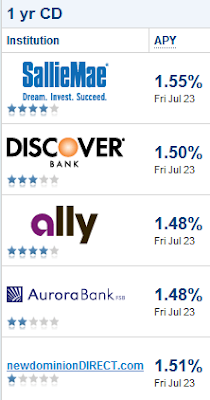 So instead of rolling over CDs the money goes into savings accounts hoping for better rates down the road. Bernanke, like Greenspan before him, is crucifying savers in an attempt to bail out banks via a steep yield curve. Unfortunately, for those getting screwed by Bernanke's scheme, better rates are likely not coming. There is no housing or internet bubble to blow this go around. Returning to the money supply debate, the difference between TMS1, TMS2, and M2 comes down to a question as to what constitutes money on demand vs. what is a credit transactions. Savings accounts are without a doubt credit transactions. People deposit money in savings accounts in return for interest. Banks lend that money out. People know that banks lend the money out. That is why they receive interest. There are no reserves on savings accounts. I worked in the industry for years. Savings accounts are TDA accounts - Time Deposit Accounts. The difference between savings accounts and CDs is CDs are type of time deposit with a fixed term and a guaranteed rate, while savings accounts are time deposits with a flexible term and in general no guaranteed rate. In contrast, checking accounts are demand deposit accounts (DDA accounts) where money is available on demand. Proponents of TMS2 maintain that savings accounts are flexible and can be withdrawn without notice and thus reflect money on demand. The debate even gets down to esoteric discussions as to whether or not savings account terms that commonly stipulate 30 days notice before withdrawal will ever be enforced. The latter point is essentially a sideshow because the real issue is not how quickly something can be converted to cash but whether or not the transaction is a credit transaction. One can pay a penalty and cash in a CD equally as well. One can write a limited number of checks on some kinds of money market accounts as well. On that basis, if one is going to include credit transactions in the aggregates, one may as well include other types of credit transactions as well. Indeed that is exactly what the flawed measure MZM (money at zero maturity does). TMS2 attempts to draw a fine line differentiating between types of credit transactions. It fails by rigorous definition (ignoring the fact that savings accounts are credit transactions) while instead focusing on the issue of presumed immediate availability, even though one has to transfer money from savings to checking or withdraw it to make it truly available. TMS2 also fails by practical application. From a practical standpoint, there is essentially no difference between money sitting in savings accounts vs. CDs if the intent in either case is to save and not to spend. 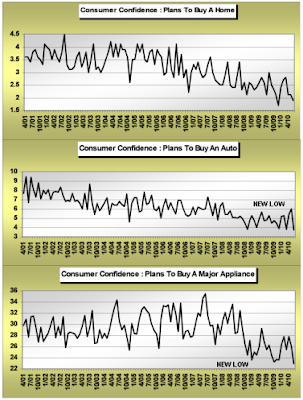 Maybe putting a bit of a tiny exclamation point behind the need of business spending to indeed pick up is data we saw in the consumer confidence report concerning consumer spending plans. We have not updated the following chart in some time, so here it is in all its glory. 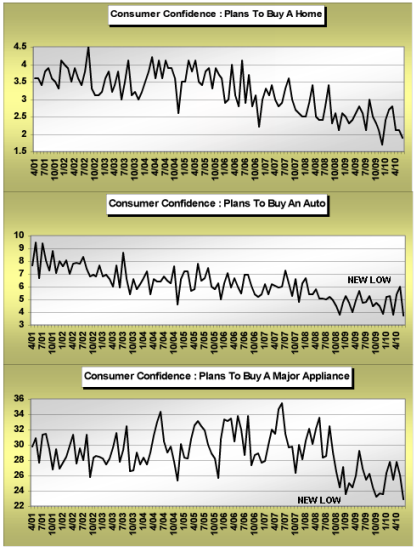 As per the report last Tuesday, consumer plans to buy major appliances and autos hit new lows. And yes, as you'd expect post the expiration of the tax credits for home buying, plans to buy homes has retreated. Wildly surprising? Not really. But it does reinforce the message of business spending importance both in 2H 2010 and into 2011. A tip of the hat to the Contrary Investor for explicit permission for the above snip. Consumers have no intention of spending. Instead, people are letting CDs expire with the money likely headed for savings accounts. It is silly to propose this is meaningful. An increase in the personal saving rate is another reason for the recent increase in savings accounts. Having reached a secular low, the savings rate now appears headed up. Indeed, the internet bubble and the housing bubble were associated with periods when the savings rate crashed! The rising savings rate, some of which is making its way into savings accounts, is a deflationary phenomenon. This is in contrast to other periods where M2, TMS2, or savings accounts rose in conjunction with a rapidly expanding economy. Thus, one must not only look at what is happening but why it something is happening to draw proper conclusions. Savings accounts rose by over $1 trillion in period 4 on the above charts, while CDs shrunk by about $460 billion. The rest of the difference is easily accounted for by sweeps, increased liquidity preferences, and a rise in the savings rate. By attempting to split hairs with what does or does not constitute "money available on demand" while ignoring the more important issue that savings accounts are credit transactions, TMS2 creates a misleading distortion out of thin air. Moreover, please remember that savings accounts do not represent money about to be lent out. 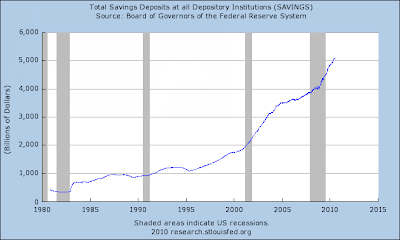 Given there are no reserves on savings accounts, banks have already lent the money out (or it sits as excess reserves on deposit with the Fed). The topic of "excess reserves" inevitably brings up a discussion of Money Multiplier Theory. Most proponents of TMS2 (and in fact most people in general) adhere to a falsehood that sideline cash and excess reserves are ready to come flooding into the market at any time causing prices to rise. In regards to excess reserves, the reality as Steve Keen and I have pointed out is "lending comes first and bank reserves come second". Please see Fictional Reserve Lending And The Myth Of Excess Reserves and also Fiat World Mathematical Model for a complete discussion. 3. 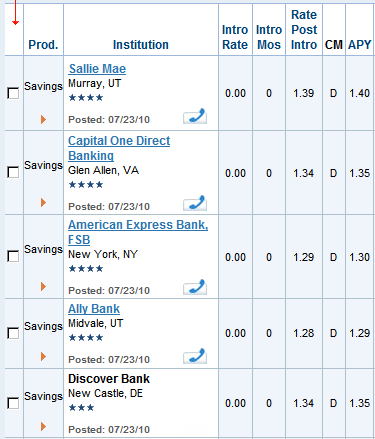 An increase in the savings rate that has turned up in savings accounts as opposed to checking accounts. Those are deflationary, not inflationary phenomena. By attempting to split hairs as to what is considered a credit transaction, TMS2 introduces a huge distortion that takes a great deal of analysis to properly sort out. Unsurprisingly, most TMS2 proponents have drawn invalid conclusions as to what the discrepancy between TMS1 and TMS2 actually means. Careful analysis shows the spread between TMS1 and TMS2 represents deflationary phenomena, the very opposite of what most TMS2 proponents suggest! 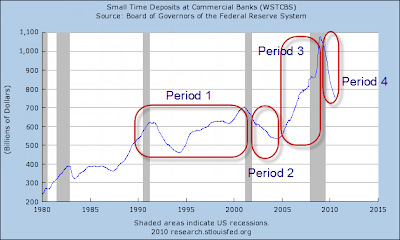 By the way, things are so distorted by the Fed because of sweeps and because of fractional reserve lending that checking account deposits that are supposed to be available on demand really aren't. For proof, think of what would happen if everyone were to attempt to pull all their checking account deposits at once. Indeed, things are so screwed up that it is easy to make a case that percentagewise, very little is truly available on demand. Nonetheless, all we can do is pick the best measure of money available. From a theoretical and practical standpoint, that measure is TMS1. I received several questions as to why savings accounts and CDs are "credit transactions". Here is a simple explanation. CDs and Savings Accounts are credit transactions because you voluntarily relinquish control of money to banks. You lend it to them. You do not lend checking accounts to banks. Instead, you deposit money with the idea that it is yours, available immediately on demand by writing checks. Some get hung up on the notion that savings accounts are immediately available. That is not technically true, as there is typically a 30 day waiting period specified in the deposit. More importantly, whether or not that waiting period is enforced or even if it exists at all (and this is where TMS2 proponents split hairs), does not alter the simple fact that savings accounts are credit transactions where control of the deposit is voluntarily handed over to the bank in return for interest, so banks in turn can lend the money out at an even higher interest rate. It is the relinquishment of ownership of the funds (however temporary - even for so long as to have to transfer money from savings accounts to checking accounts to make use of it) that makes CDs and Savings Accounts credit transactions. By splitting hairs between various types of credit transactions, primarily based on how fast control of money can be regained by the depositor, TMS2 distorts the picture of what is really happening and what it all means. Bear in mind, the Fed has so distorted the system that "It's all credit". 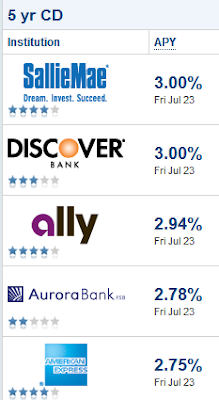 There is nothing backing any of this, including checking accounts. The fact that "It's all credit" should not stop us from making the best theoretical case we can for what should be considered credit transactions vs. non-credit transactions.